The bad new is that, as of 15 September, late-planted corn younger than the early dent stage of kernel development will NOT likely mature safely prior to a killing fall frost. The good news is that the overwhelming majority of Indianas corn acres will be beyond that stage of development by that date, partially due to the continued warmer than normal weather to date. he shorter growing season that results from delayed corn planting often triggers concern among farmers and the grain markets that some late-planted corn may not safely mature prior to the occurrence of a killing fall frost. This concern is increasingly legitimate for corn planted later and later into June, especially in northern and eastern Indiana. As a reminder, approximately 75 percent of Indianas 2002 corn crop was planted prior to June, another 17 percent between June 2 and June 9, and another 6 percent between June 9 and June 16 (Indiana Ag. Statistics Service, 2002). The majority of the later planted corn resides in southern Indiana, but pockets of late planted corn also exist in the eastern side of the state. The point at which corn grain is safe from frost is defined as physiological maturity and is correlated with the appearance of the thin, black layer of dead tissue at the tips of the kernels. Grain moisture at physiological maturity ranges from 25 to 40 percent moisture content, but typically is near 30 percent. Additional field drydown is usually required before the grain can be harvested without damaging the kernels. 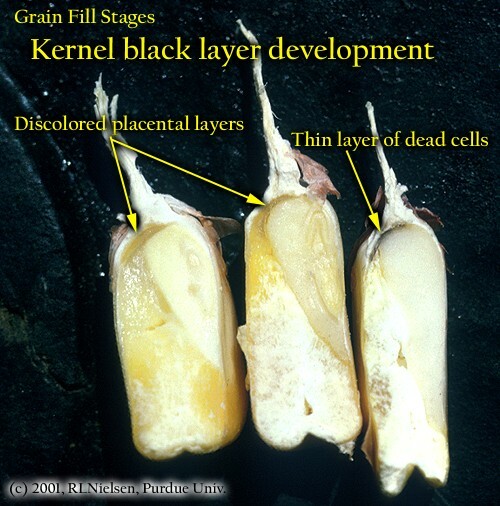 A killing frost prior to normal black layer formation will cause the premature development of the kernel black layer, resulting in incomplete grain fill and lightweight, chaffy grain. Grain moisture content will be greater than 35 %, requiring substantial field drydown before harvest. Yield loss due to fall frost damage depends on the severity and extent of the plant damage (Carter & Hesterman, 1990). Yield losses from total plant death prior to kernel black layer are estimated to be 55, 41, and 12 % for soft dough, full dent, and half-milk line stages of development, respectively. Yield losses from death of leaves only (not stalk) prior to kernel black layer are estimated to be 35, 27, and 6 % for soft dough, full dent, and half-milk line stages of development, respectively. Yield losses are less when only leaves are killed because the surviving stalk can remobilize carbohydrates from the stalk tissue to the developing ear for some time after the damage occurs. As of 8 September, only 20 percent of Indianas corn was mature and safe from frost, another 44 percent was at the dent stage of kernel development, while approximately 30 percent was at the dough stage (Indiana Ag. Statistics Service, 2002). Only about six percent of the states crop had not yet reached the dough stage as of 8 September. These values describe crop development that is about one week behind the 5-year average, not bad considering that planting progress in late May was nearly three weeks behind the 5-year average! Assessing the vulnerability of late planted corn to fall frosts hinges on whether immature grain will reach physiological maturity before a damaging frost. Many agronomists define a killing fall frost in terms of air temperature at 28 degrees F (-2 degrees C) or less that causes complete death of whole plants. Frost damage that occurs at slightly warmer temperatures will injure leaves, but will not necessarily kill the whole plant. The timing of the occurrence of physiological maturity in corn can be estimated on the basis of kernel developmental stage at a point in time, the expected heat units or growing degree days (GDDs) necessary to advance the grain to physiological maturity from that point in time, and the expected availability of GDDs remaining from that point in time until the date of a killing frost. Research conducted by Peter Thomison (Ohio State Univ.) and myself demonstrated that late-planted corn matures in fewer GDDs than early-planted corn. Much of the reduction in season-long GDDs occurs during the grain filling period. Based on our delayed planting/GDD research, average dates of fall frosts, and normal (historical) GDD accumulation values for regions of Indiana, the following guestimates can be made about kernel stages of development as of 15 September that should safely mature prior to a killing fall frost. The bad new is that by 15 September, late-planted corn younger than the early dent stage of kernel development will NOT likely mature safely prior to a killing fall frost. The good news is that the overwhelming majority of Indianas corn acres will be beyond that stage of development by that date, partially due to the continued warmer than normal weather to date. Carter, P.R. and O.B. Hesterman. 1990. Handling Corn Damaged by Autumn Frost. http://www.agcom.purdue.edu/AgCom/Pubs/NCH/NCH-57.html [URL Verified 9/10/02]. Hurburgh, Charles and Garren Benson. 1995. Frost Damage to Corn and Soybeans. http://www.exnet.iastate.edu/Publications/PM1635.pdf [URL Verified 9/10/02]. Neild, Ralph and James Newman. 1990. Growing Season Characteristics and Requirements in the Corn Belt. http://www.agcom.purdue.edu/AgCom/Pubs/NCH/NCH-40.html [URL Verified 9/10/02]. Newman, James. 1981. Determining Spring and Fall Frost-Freeze Risks in Indiana. http://www.agcom.purdue.edu/AgCom/Pubs/AY/AY-231.html [URL Verified 9/10/02]. Nielsen, Bob. 2002. Grain Fill Stages in Corn. http://www.kingcorn.org/news/articles.02/Grain_Fill-0723.html [URL Verified 9/10/02]. Nielsen, Bob and Peter Thomison. 2002. Delayed Planting and Hybrid Maturity Decisions. http://www.agry.purdue.edu/ext/pubs/AY-312-W.pdf [URL Verified 9/10/02]. Taylor, Richard and Richard Barczewski. 1998. Managing Frost-Damaged Silage Corn. http://bluehen.ags.udel.edu/extension/information/af/af-10.htm [URL Verified 9/10/02].